The International Criminal Court is being accused of “defying justice” following Thursday’s announcement that prosecutors will not further investigate or press charges against Israel for its 2010 deadly assault on a Gaza-bound flotilla bearing humanitarian aid from Turkey. The ruling came despite the court’s acknowledgement that Israel likely committed war crimes. “In the final analysis, I have, therefore, concluded that the legal requirements under the Rome Statute to open an investigation have not been met and I am announcing that the preliminary examination has been closed,” Besouda decided. The ICC’s ruling is the result of a preliminary investigation launched by Bensouda last year after the African state of Comoros, an ICC member, filed a complaint to the court. Israel and Turkey are not members of the court, and Turkey is separately pursuing legal action against Israeli military officers behind the attack. Israeli naval commandos stormed the Mavi Marmara on the May 31, 2010, immediately killing nine people and wounding over 50, with one person later dying from the wounds sustained. Eighteen-year-old U.S. citizen Furkan Doğan was filming the raid when he was shot several times, including in the face at point-blank range, resulting in his death. In the aftermath of the attack, Israel faced international criticism and protest, including demands from the Turkish government for a formal apology, which Israel has repeatedly refused. 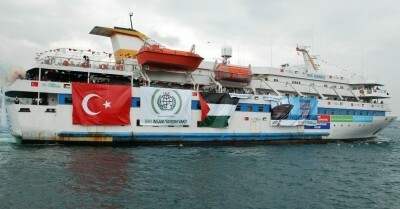 The Mavi Marmara was one of six ships in 2010, organized by an international coalition of campaigners for Palestinian rights, blocked and raided by Israel while attempting to break the siege of Gaza. For the past six years, solidarity ships have sought to sail to Gaza from around the world, but since 2008, none have reached their destination. Following Isreal’s latest seven-week attack on Gaza, civil society groups from around the world announced in August they will sail another “freedom flotilla” to break the siege, but did not publicly disclose a location or date.